PALMDALE, Calif. --- Northrop Grumman Corporation is taking the first steps toward giving the B-2 Spirit stealth bomber the ability to destroy moving targets under a current contract with the U.S. Air Force. Northrop Grumman is the prime contractor for the B-2, the flagship of the nation's long-range strike arsenal. 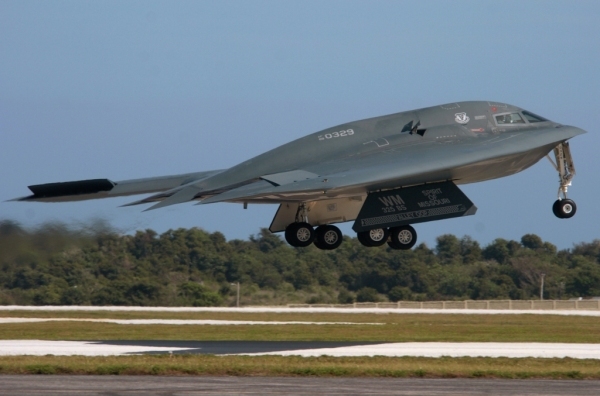 Under a one-year, $9.33 million contract, the company has begun preparing the B-2 to carry and deploy small, precision-guided weapons such as the 250-pound class Small Diameter Bomb II (SDB II). The company's work is focused on upgrading the aircraft's current display and weapon interfaces to accommodate this class of weapons. The SDB-II is currently in development and source selection. "This new Moving Target Kill (MTK) capability is the latest in a series of upgrades defined by the Air Force/Northrop Grumman-led industry team to increase the lethality and fighting effectiveness of the B-2," said Dave Mazur, vice president of Long Range Strike for Northrop Grumman's Integrated Systems sector. "It will allow commanders to deal decisively with an increasingly decentralized and mobile enemy under all weather conditions." Implementing the MTK capability requires upgrading the B-2's current analog, multi-function cockpit displays and qualifying several of its radar modes to perform the MTK function. Under the current contract, Northrop Grumman is developing and testing a brassboard version of the replacement displays in a laboratory environment. The new systems will be able to display both analog and digital data. Northrop Grumman has also started planning for the required installation of the Universal Armament Interface (UAI) on the B-2. The UAI is a new "plug and play"-like interface developed by the Air Force to reduce the time and costs required to integrate precision guided weapons on airborne platforms. It standardizes the physical connections and communications protocols used to pass information between an aircraft and the on-board weapons stores. Full implementation of the UAI will also require upgrading the B-2's display control processor and its stores management processor. Those upgrades are not a part of the current contract. 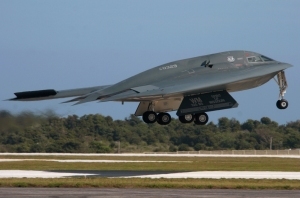 The MTK capability is the latest in a series of B-2 modernization efforts undertaken by Northrop Grumman and its subcontractors to help the Air Force ensure that the aircraft remains fully capable against evolving threats.